EndTime Issues ... : Harbinger: "The Antichrist"
In the first year of the Babylonian Empire’s final king, Belshazzar, Daniel had a dream/vision of four beast-like empires that paralleled those of the image dream of Daniel 2. In that Daniel 7 narrative, he conveyed important additions and details. There, the four beasts come out of a sea that is churning because of four winds, representing the points of the compass. These winds parallel those of Revelation 7:1, where they are being held back by mighty angels. They symbolize intense political strife and world chaos (Ezekiel 37:9, Zechariah 2:6). The sea denotes humanity in great tumult at a time of widespread lawlessness (Isaiah 57:20). As these powers arose, warring “empires” infiltrated the Middle Eastern world. A fifth kingdom, represented in Daniel 2 by a stone cut out without hands, emerges as an everlasting dominion governed by one “like” a human (called the Son of man in the KJV). He receives world honor and worship after His “installation” by the Ancient of Days (Daniel 7:13-14). This man-like being becomes a sovereign ruler. Daniel’s term “dominion over” (sholtan – A) usually relates to a divine being. Though much debate has recently emerged as to who He is, this insight from the BDB Lexicon is most valuable. This event represents a transition in time within the Daniel 7 prophetic narrative! Before there is a vertical coming to earth by Christ, there must be a horizontal coming to the Ancient of Days, culminating in the reception of His eternal kingdom. Among the renditions of those beast kingdoms, a remarkable power rises on the fourth, or Roman Empire, beast. It is a new and eleventh horn agent. Unique in Daniel’s record, that beast, with this seditious horn, is finally destroyed by fire (Daniel 7:11, Revelation 19:20). This follows a courtroom scene with the Ancient of Days presiding (Daniel 7:9-10). Stunning – that “extra” horn also has characteristics “like” a human (vs 9), seemingly in competition with the “Son of man” (vs 13) portrayed in the Aramaic narrative. This little horn is the Bible’s key introduction to the apocalyptic Antichrist. Throughout the prophetic messages there is this “clash” of power between Christ and the Antichrist (representing Satan). The expanse of time portrayed in Daniel 7 spreads from the B.C. era into the final months of earth’s history! This Antichrist power is a prophetic concern to God. It not only opposes Him but even functions as if it were Him! The imagery of the beast and horn being burned (Daniel 7:11) means that they are totally destroyed – eradicated – extinguished. Removing the false Christ and his minions precedes the reception of the kingdom and its many surrounding events. There would be interpretive questions from this brief narrative if the story was without additional striking details. Remarkable information flows from Daniel’s continued visions. There is much debate and opinion that detract from the beauty of what unfolds. At some point after the literal Roman Empire rises, and while the little horn is active, that heavenly judgment scene commences. Again, the destruction of the beast and Antichrist/horn follows heaven’s judicial work – an important contextual sequence. Then that wonderful scene of hope and consummation of God’s kingdom arrives. The “Son of man” comes to the Ancient of Days in a heavenly horizontal scene. Who this Being is has raised conflicting questions except for the “cloud” reference (Daniel 7:13). This Being comes to the Ancient of Days with clouds. It says that he is “like” a “Son of man” or “son of a human.” That one word, “like” (a simile), implies, according to Steinmann, that he is far greater than any ordinary man (cf. Ezekiel 1:26). That cloud intimates a divine being, which can be none other than the Messiah. This, with the subsequent Aramaic word for “dominion over,” clinches His divine nature. Christ was then “given authority, glory and sovereign power; all nations and peoples of every language worshiped him. His dominion is an everlasting dominion that will not pass away, and his kingdom is one that will never be destroyed” (Daniel 7:14 – NIV). His ruling authority is eternal (cf. Daniel 2:44, 6:27) – it never ceases. The world worships Him (Daniel 7:14). This is the terminus ad quem of redemption. Antedating this, the world worshiped the Antichrist and even Satan himself (Revelation 13:4). Amazing – another of those competing issues! “And the seventh angel sounded; and there were great voices in heaven, saying, The kingdoms of this world are become the kingdoms of our Lord, and of his Christ; and he shall reign for ever and ever. And the four and twenty elders, which sat before God on their seats, fell upon their faces, and worshipped God, Saying, We give thee thanks, O Lord God Almighty, which art, and wast, and art to come; because thou hast taken to thee thy great power, and hast reigned” (Revelation 11:15-17). Receiving His kingdom means that He has completed His legal priestly role (I John 2:1, I Timothy 2:5, Hebrews 9:15). The intercessory work has ceased. He has now put on His kingly robes. We now can outline an expanded Daniel 7 template related to Christ and the Antichrist that will be apropos to all other apocalyptic prophecy. Might this coming to the Ancient of Days mean even more? This echoes the words of a late Bible student. “While I was watching, thrones were set up, and the Ancient of Days took his seat. His attire was white like snow; the hair of his head was like lamb’s wool. His throne was ablaze with fire and its wheels were all aflame. A river of fire was streaming forth and proceeding from his presence. Many thousands were ministering to him; many tens of thousands stood ready to serve him. The court convened and the books were opened” (Daniel 7:9-10). Daniel ardently wanted to know more about the fourth beast and its horns. He was “grieved” (filled with anxiety) (7:15) by what he had seen. He inquires of one of the many beings he saw in this vision (vs 16) (likely Gabriel, who is an interpreting angel named in Daniel 8 and 9). “I came near to one of those who stood by, and asked him the truth of all this. So he told me and made known to me the interpretation of these things” (Daniel 7:16 – NKJV). Since the narrative has already described two “ends” (vs 11, 14), might there be other clues describing when those events occur? Are there other things that relate to these narratives? This angel does present new and helpful information. Before the fourth beast’s end comes, that strange horn on its head is allowed to “overcome” God’s people (Daniel 7:21; cf. Daniel 8:10-11, 11:33-34; Revelation 11:7, 13:7)! That is what lies ahead, emanating from the Antichrist. This continues “until the Ancient of Days came and pronounced judgment in favor of the holy people of the Most High, and the time came when they possessed the kingdom” (Daniel 7:22 – NIV). Once again, this provides another distinct “end.” The war – the persecution – goes on until the judgment is given in favor of the saints (who will make up Christ’s kingdom). Concluding statements elsewhere of the outcome of that review: “To him that overcometh will I grant to sit with me in my throne, even as I also overcame, and am set down with my Father in his throne” (Revelation 3:21). The first scene of the Ancient of Days (7:9-10) is reduced to a simple phrase, “until the Ancient of Days came” (7:22). “In place of repeating the enthronement of the Son of Man (7:13-14), Daniel describes the effect on the saints of his enthronement here at his second coming.” The outcome of the wedding has occurred. The meaning of “joint heirs with Christ” (Romans 8:17) is seen! The identification of the fourth beast and little horn as wicked (vs 11). The identification of those who make up Christ’s kingdom (vss 13-14). The saints who make up that kingdom are the subject of a war involving the beast and the little horn before the end (vss 21-22). The saints and Christ – those “like” human – receive the kingdom together. “These have one mind, and shall give their power and strength unto the beast” (which has a harlot rider) (Revelation 17:13; cf. Daniel 7:24). Those ten horns of the beast plus that little horn make eleven horns. Daniel’s fourth beast also had ten horns plus the little horn, which totaled eleven horns. Thus, all the same prophecy. Heaven’s instructor returns to the little horn theme after noting its beast is globally powerful and destructive (vs 23-25). The horn’s focused concerns relate to its anti-God/anti-saints activities/actions (vs 25). Its “declarations” are against the “most High.” Previously, the little horn was shown as “speaking great things” (vss 8, 20), now we know it is specifically against God. The saints are worn down/wearied by dealing with this blasphemous teaching and persecution. Then the little horn gets coercive by changing “times and laws” that God had established. Because “times” and “laws” are together, many scholars logically assume that they must be laws related to time. Others incorrectly relate the Antichrist prophecies to Antiochus IV Epiphanes, who required the Jews to “profane Sabbaths and feasts.” Elsewhere in Daniel 8 and 12 it is apparent that the seventh-day Sabbath is one of its focused targets. Satan knows when his time is short and wars against the saints for a specific period of three and a half years (Revelation 12:12, 15, 17). 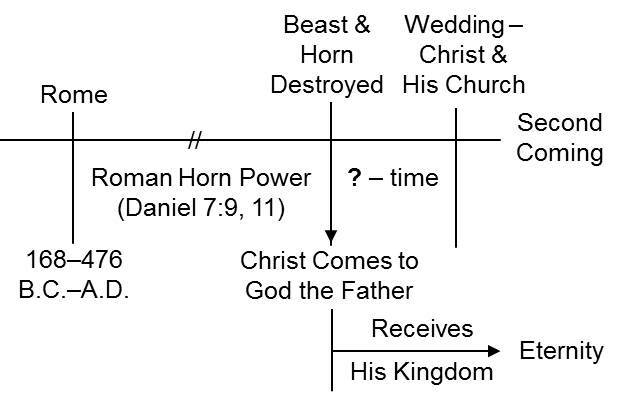 Here in Daniel the context is the same with the Antichrist warring against God and the saints – limited by divine purpose to “time times and dividing of times.” This is replicated in other end-time prophecies (Daniel 12:7; Revelation 11:2-3; 12:6, 14; 13:5). Satan’s representative is identified by Paul as “the man of lawlessness” (II Thessalonians 2:3). What law does the devil and his minions hate? The one that judicially checks their apostasy! “Behold, all souls are mine; as the soul of the father, so also the soul of the son is mine: the soul that sinneth, it shall die…. The son shall not bear the iniquity of the father, neither shall the father bear the iniquity of the son: the righteousness of the righteous shall be upon him, and the wickedness of the wicked shall be upon him” (Ezekiel 18:4, 20). There is an individual standard. “Whosoever committeth sin transgresseth also the law: for sin is the transgression of the law” (I John 3:4). The Decalogue was so sacred it was placed in the Ark of the Covenant (Deuteronomy 31:5-6) and then couldn’t be touched by a human finger on pain of death. They were recorded for mankind with God’s finger on stone (Exodus 31:18). Those ten precepts serve as the perpetual foundation for all of God’s promises (Deuteronomy 4:13). Satan’s objectives can only be achieved through an alteration of or minimizing those divine regulations. His earthly “General” is the Antichrist, who plans to challenge God’s governing principles! In Aramaic it states that there is an “intention” (sebar – A) or “plan” to change “times and laws.” It is premeditated. This would challenge even the worship practices of God’s people. Since it is also related to time, the Sabbath is threatened. The persecution of God’s people would somehow be a spinoff of this. Gabriel said that would last for a three-and-a-half-year period (cf. Daniel 12:7). God’s authority will be usurped. Human words and rules are to be substituted for God’s Word – specifically His standard. This will ultimately mean “another gospel” has been promoted by the Antichrist (Galatians 1:16). In Daniel 12:11 that intent actually becomes law! “And from the time that the daily [sacrifice] is taken away, and the abomination of desolation is set up [legal move], there shall be one thousand two hundred and ninety days” (Daniel 12:11). The animal sagas ended with an executive judgment of fire (7:11). Christ receiving His dominion (7:13-14) contextually must occur after the “saints” were judicially declared its citizens (7:22). As Christ then receives His dominion, the little horn Antichrist, who acts on Satan’s behalf, loses his dominion through the same judgment process (7:26)! Though the temptation to push much of Daniel 7 into the annals of history has been popular, there are repeated summation statements of a divinely directed end to rebellion and sin! Intriguingly, during the seventh vial plague, Babylon, the label for Satan’s false trinity, comes to its end (Revelation 16:19). This must occur just before the eschaton. All Antichrist/little horn/beast/king of the north prophecies fit into this template. Daniel 7 creates an amazing “prophetic mold” that forwards our understanding. What about the Dark Ages, when millions of loyal Christians were tortured and murdered? It is part of the broad time span of Rome’s anti-God history. The flow of information constantly moves toward the culmination of redemptive history. The search for a focus of “present end-time truth” is its ever present objective. The last period of time is three and a half years. It is the finale of redemptive history. This is so important that it is referenced over and over in apocalyptic prophecy. It begins with an “abomination” that changes times and laws (Daniel 12:11). Jesus, in His Olivet Discourse, broke into the middle of His narrative to urge His students to go to Daniel, where that change is specifically discussed. The information for “this hour” is extensive. The more it is studied, the more exciting it gets! Daniel 7 is a metaphor of end-time prophecy. Steinmann, Andrew E.; Daniel (Concordia Publishing House, St. Louis, 2008), p. 342. Archer, Gleason L., Jr.; “Daniel”; Gaebelein, Frank E., general editor The Expositor’s Bible Commentary, vol. 7 (Zondervan; Grand Rapids, MI 49530; 1981), p. 85. Brown, Driver and Briggs Lexicon. Miller, Stephen R.; The New American Commentary, Daniel, vol. 18 (Broadman & Holman Publishers, 1994), p. 205. Ford, Desmond; Daniel (Southern Publishing Association; Nashville, TN; 1978), p. p. 147. Steinmann, op. cit., pp. 339-340. Sabourin, Leopold; Biblical Theological Bulletin 4, “The Biblical Cloud” (1974), p. 304. Doukhan, Jacques B.; Secrets of Daniel (The Review and Herald Publishing Association; Hagerstown, MD 21740; 2000), p. 117. White, Ellen G.; Story of Redemption, p. 404. White, Ellen G.; Early Writings, pp. 34-35. White, Ellen G.; Word to a Little Flock, p. 12. White, Ellen G.; The Great Controversy, p. 428. Collins, John J.; Daniel (Fortress Press, Minneapolis, MN – 1993), p. 311. Archer, op. cit., p. 93. Steinmann, op. cit., p. 372. Archer, op. cit., p. 94. Collins, op. cit., p. 322. Whitcomb, John C.; Daniel (Moody Press; Chicago, IL - 1985), p. 104. Steinmann, op. cit., pp. 363, 374. Miller, op. cit. p. 214.